What’s a Schnecken? Some kind of gadget souvenir? This was the thought that crossed my mind when I found this recipe in “The Art of Fine Baking.” After reading through it and then of course baking some, I came to the conclusion that these are basically small, almost bite sized, cinnamon/caramel rolls. 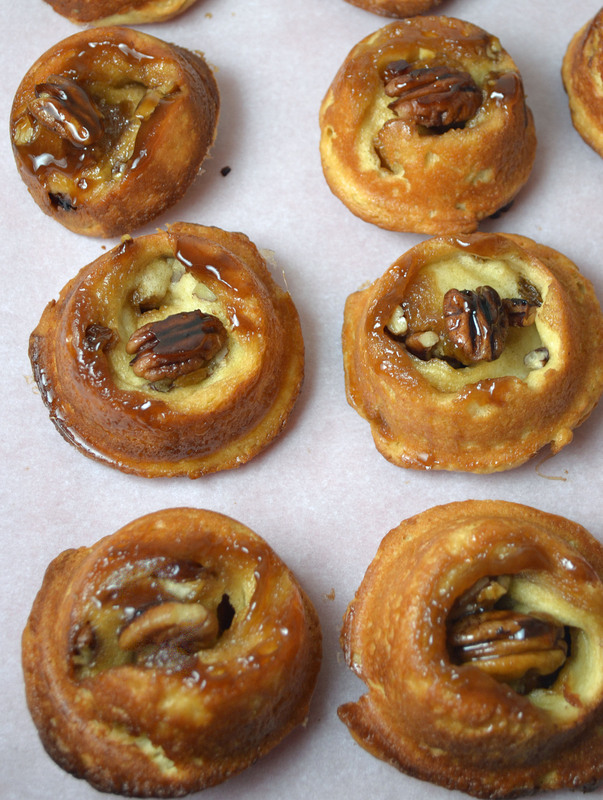 For those of you who are unfamiliar with Schnecken, as I was, it’s a German pastry and the name Schnecken means snails – referring to the shape of these delicious breakfast treats. Apparently, Schnecken are often confused with rugelach (also German) but I don’t see much of a similarity other than that they are both rolled pastries creating a spiral of the filling. I happen to have a weakness for caramel and cinnamon rolls and though these photos may lack the bells and whistles of a carefully styled shoot, you can see that this recipe definitely delivers on all the important aspects: ooey gooey caramel, crunchy nuts, cinnamon, and raisins. One tip: just make sure to use enough of the butter sugar mixture – the softer and stickier, the better. Cream butter with 1/2 cup light-brown sugar. Beat in corn syrup. Grease regular size or mini muffin tins with this mixture, using it generously. Place 2 or 3 pecan pieces into each muffin cup. Roll dough into a long rectangle 1/4 inch thick. Sprinkle with remaining sugar, cinnamon, raisins, and crushed pecans. Roll dough tightly, jelly-roll style, sealing the seam. If roll becomes much thicker than the size of muffin tins, stretch it out. If it is too thin, gently compress it. Slice roll into pieces which will fill muffin cups halfway. Press into cups firmly. Let rise only until dough looks puffy. Bake in preheated oven about 20 minutes, or until tops of shnecken are golden brown. 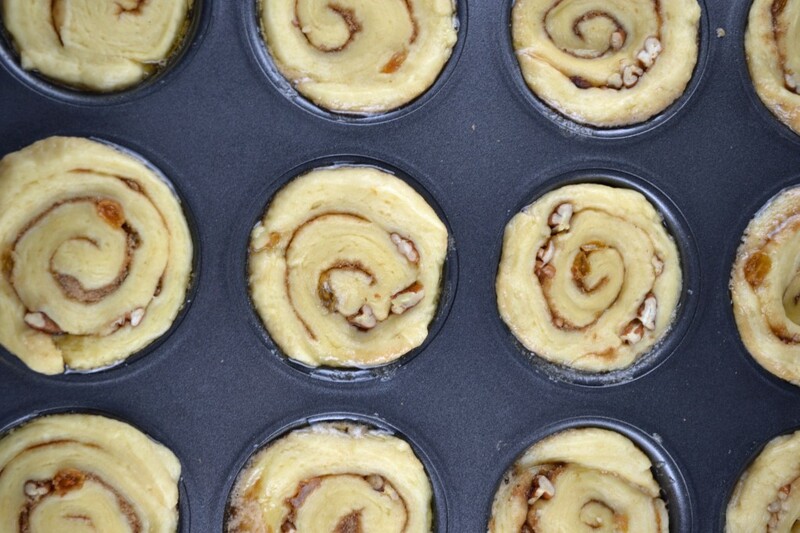 Turn muffin pans upside down immediately, to remove schnecken and to permit glaze to run over sides. Yield: approximately 7 dozen small shnecken or 5 dozen larger ones. Recipe can be easily halved.